OnError Writes a log entry when an error occurs. OnExecStatusChanged Writes a log entry when the execution status of the executable changes. 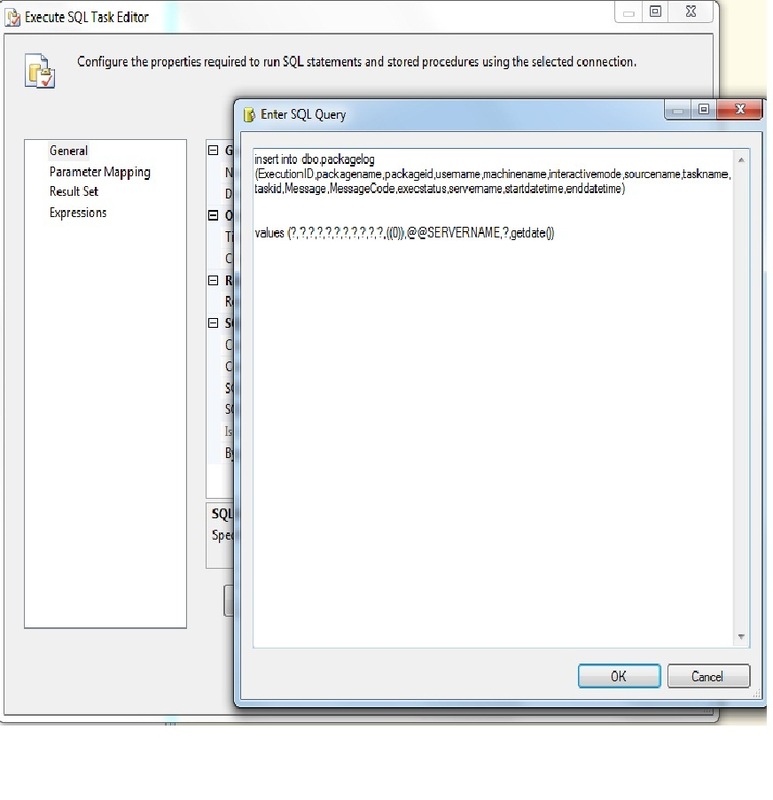 OnInformation Writes a log entry during the validation and execution of an executable to report information. OnPostExecute Writes a log entry immediately after the executable has finished running. 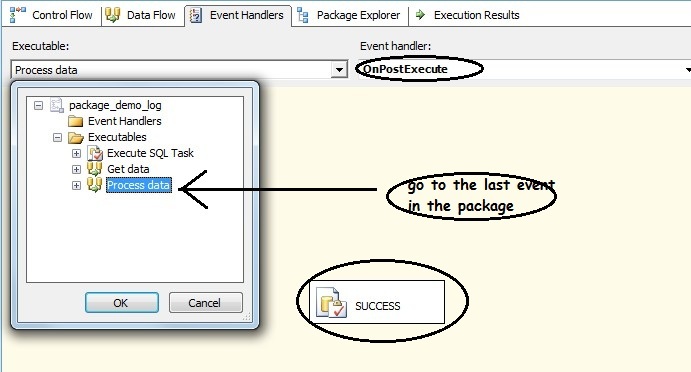 OnPostValidate Writes a log entry when the validation of the executable finishes. OnPreExecute Writes a log entry immediately before the executable runs. OnPreValidate Writes a log entry when the validation of the executable starts. OnProgress Writes a log entry when measurable progress is made by the executable. 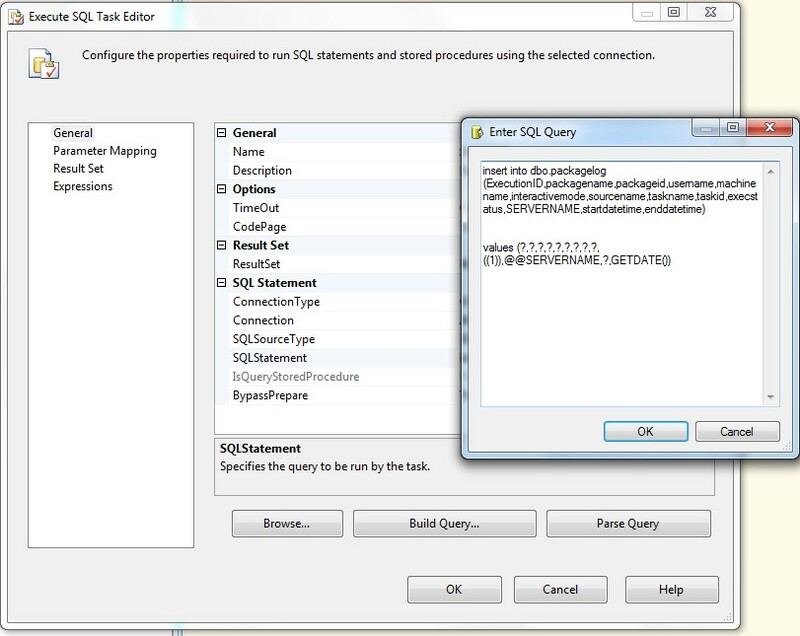 OnQueryCancel Writes a log entry at any juncture in the task processing where it is feasible to cancel execution. OnTaskFailed Writes a log entry when a task fails. 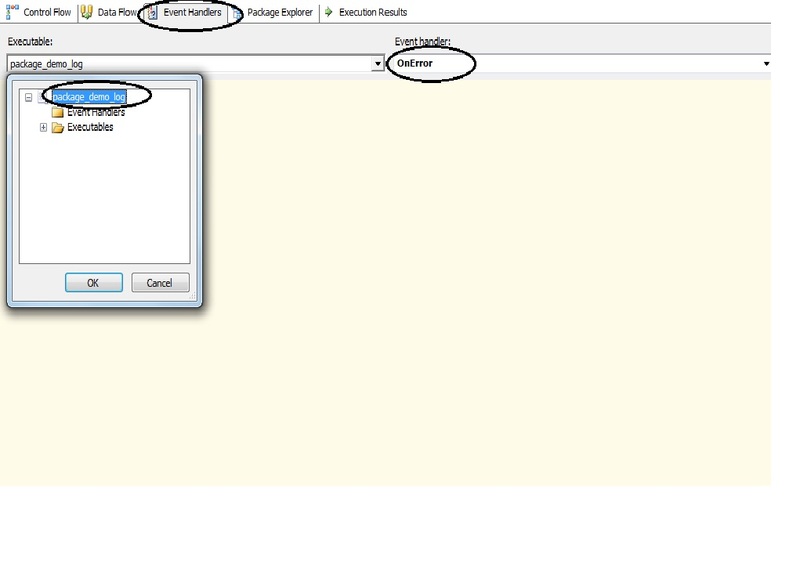 OnVariableValueChanged Writes a log entry when the value of a variable changes. OnWarning Writes a log entry when a warning occurs. PipelineComponentTime For each data flow component, writes a log entry for each phase of validation and execution. The log entry specifies the processing time for each phase. BufferSizeTuning Indicates that the Data Flow task changed the size of the buffer. The log entry describes the reasons for the size change and lists the temporary new buffer size. OnPipelinePostEndOfRowset Denotes that a component has been given its end-of-rowset signal, which is set by the last call of the ProcessInput method. 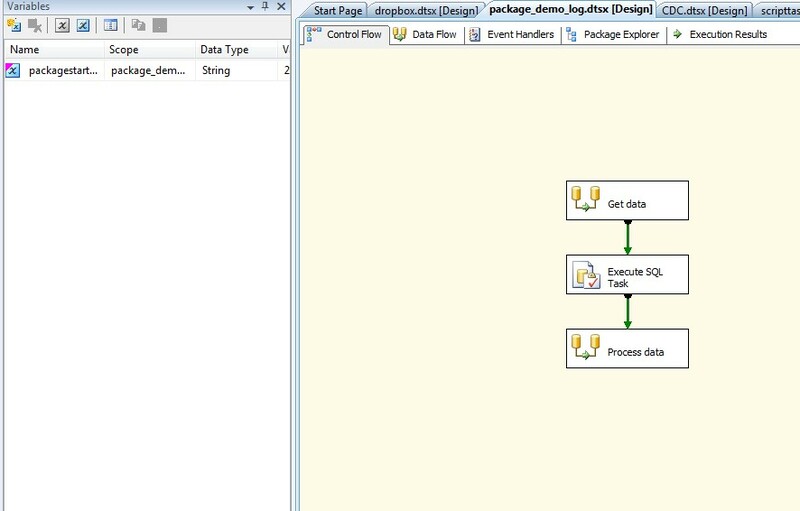 An entry is written for each component in the data flow that processes input. The entry includes the name of the component. OnPipelinePostPrimeOutput Indicates that the component has completed its last call to the PrimeOutput method. Depending on the data flow, multiple log entries may be written. If the component is a source, this means that the component has finished processing rows. OnPipelinePreEndOfRowset Indicates that a component is about to receive its end-of-rowset signal, which is set by the last call of the ProcessInput method. 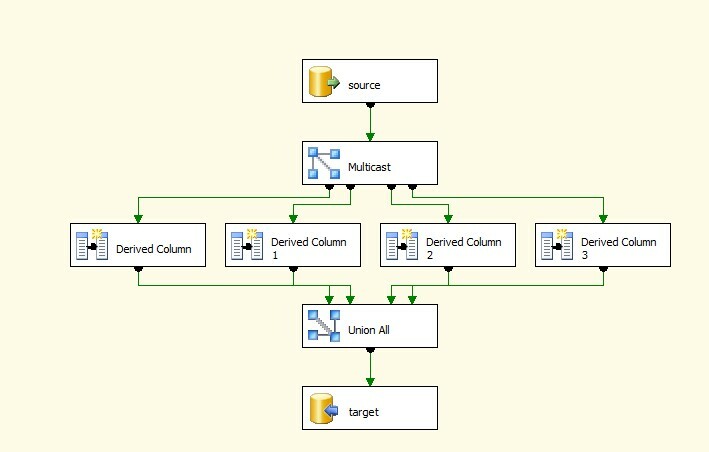 An entry is written for each component in the data flow that processes input. The entry includes the name of the component. OnPipelinePrePrimeOutput Indicates that the component is about to receive its call from the PrimeOutput method. Depending on the data flow, multiple log entries may be written. 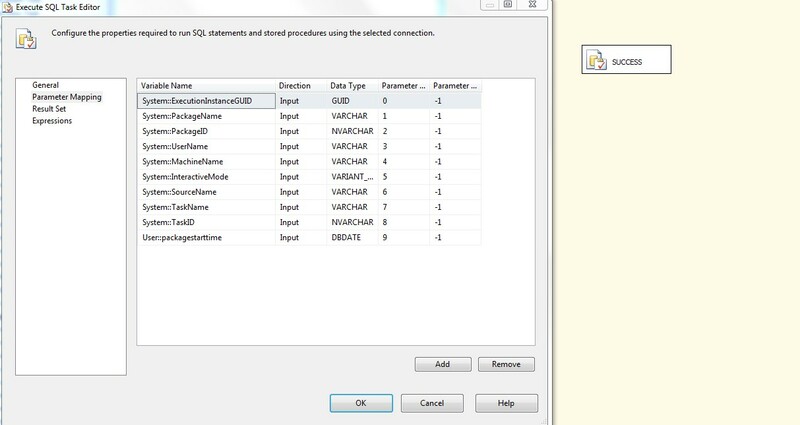 OnPipelineRowsSent Reports the number of rows provided to a component input by a call to the ProcessInput method. The log entry includes the component name. PipelineBufferLeak Provides information about any component that kept buffers alive after the buffer manager goes away. This means that buffers resources were not released and may cause memory leaks. The log entry provides the name of the component and the ID of the buffer. 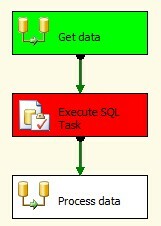 PipelineExecutionPlan Reports the execution plan of the data flow. It provides information about how buffers will be sent to components. This information, in combination with the PipelineExecutionTrees entry, describes what is occurring in the task. PipelineExecutionTrees Reports the execution trees of the layout in the data flow. The scheduler of the data flow engine use the trees to build the execution plan of the data flow. PipelineInitialization Provides initialization information about the task. 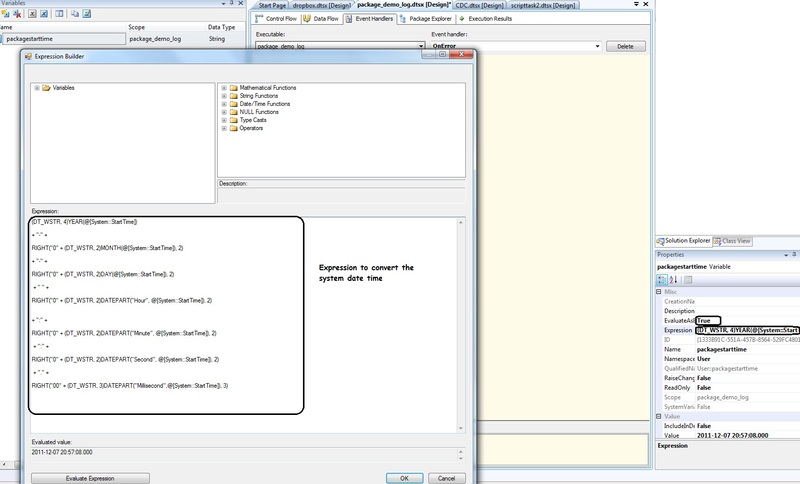 This information includes the directories to use for temporary storage of BLOB data, the default buffer size, and the number of rows in a buffer. 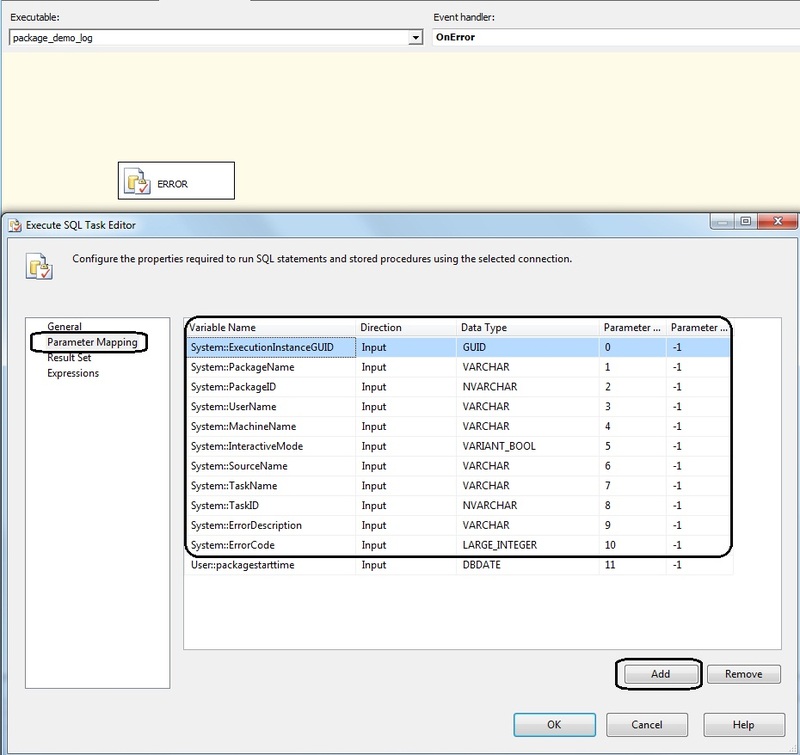 Depending on the configuration of the Data Flow task, multiple log entries may be written. Why do we need custom logging using event handlers? 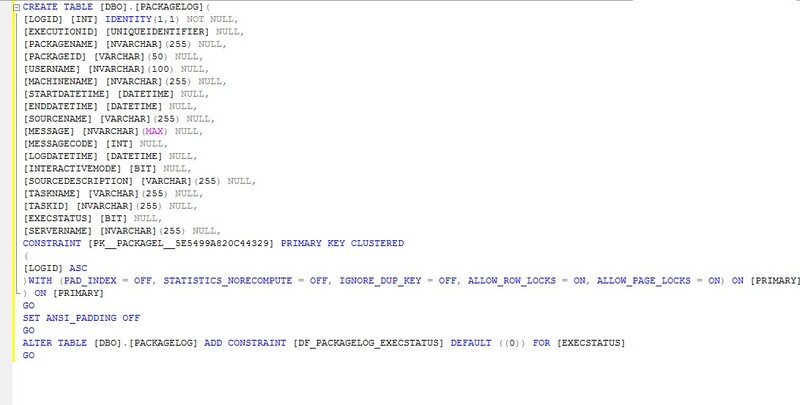 CancelEvent Int32 The handle to a Windows Event object that the task can signal to indicate that the task should stop running. CreationDate DateTime The date that the package was created. CreatorComputerName String The computer on which the package was created. CreatorName String The name of the person who built the package. ExecutionInstanceGUID String The unique identifier of the executing instance of a package. InteractiveMode Boolean Indicates whether the package is run in interactive mode. 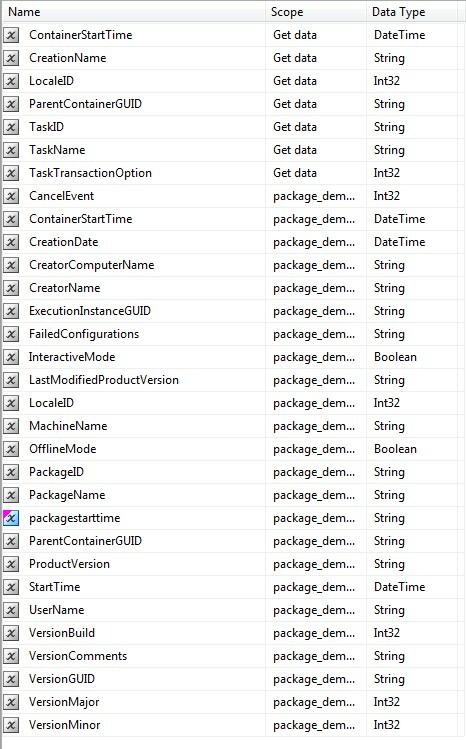 If a package is running in SSIS Designer, this property is set to True. If a package is running using the DTExec command prompt utility, the property is set toFalse. LocaleId Int32 The locale that the package uses. MachineName String The name of the computer on which the package is running. OfflineMode Boolean Indicates whether the package is in offline mode. Offline mode does not acquire connections to data sources. 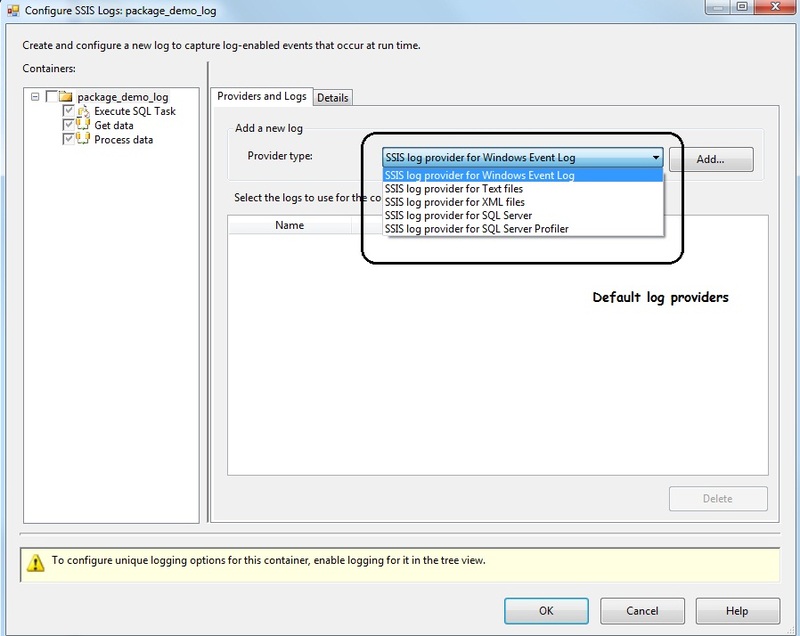 PackageID String The unique identifier of the package. PackageName String The name of the package. StartTime DateTime The time that the package started to run. UserName String The account of the user who started the package. The user name is qualified by the domain name. VersionBuild Int32 The package version. VersionComment String Comments about the package version. VersionGUID String The unique identifier of the version. VersionMajor Int32 The major version of the package. VersionMinor Int32 The minor version of the package.